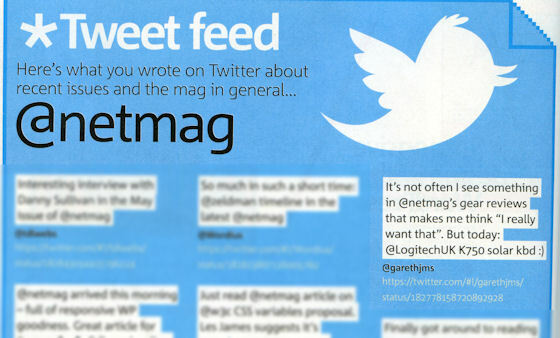 IA decisions in net magazine: why not match up the browser icons? Since the net magazine rebrand a few months ago the projects section of the magazine, which is printed on a rougher paper to distinguish itself more easily from the glossier feature articles, often includes a handy guide to which browsers a particular technology supports. The infographic shows desktop browser support on the left, mobile/tablet support on the right. But in the spirit of Steve Krug’s book Don’t me me think, the way it is currently laid out has me thinking too much. I want to know what their design reasoning is. Why don’t the icons match up? This just makes me think too hard. But whenever I see this it always makes me wonder why they have not matched up the icons. What is the order being shown here? It’s really not obvious to me. It’s not alphabetical, it’s not by version number, or popularity. Why not simply show a comparison between desktop version and its comparable mobile version, and then any left over can be arranged at the bottom? I often find myself thinking, “Okay, so this feature is supported from Chrome version 6 onwards, but from which version of mobile Chrome is this supported?” And then I have to go hunting for the Chrome icon on the right-hand list. Why not match the icons up, like this? That makes it much easier for me to read. My five year old Joshua thinks this makes more sense. What do you think? Posted on Saturday 29 March 2014 Thursday 14 December 2017 Categories WebTags .net magazine, browser icons, design, IA, information architectureLeave a comment on IA decisions in net magazine: why not match up the browser icons? Mobile attitudes–how many apps do you have installed? In this month’s .net magazine there is an interesting article about Mobile attitudes that focuses on who is accessing the Web via mobile devices and why. Rookie – tend to be older, watch less TV, listen to less radio and surf the Web less than others. They tend to have around 9 apps installed on their smartphone, if they indeed have a smartphone. Rationalist – generally between 25-45, they are happy to use the Web on their mobile device but are very selective about what they access. They have a general lack of understanding about what extra value their mobile access can offer them. Everyday – mostly under 35, these are heavy mobile Web users who understand the value that mobile Web offers, but they would generally prefer to be sat in front of their desktop PC/Mac or laptop. Restless – for this demographic, mostly under 34, the mobile Web is an integral part of their everyday life. They understand what value mobile usage brings, and they consume a lot of media, not just online but TV, radio, magazines, etc. Something that struck me about the article was how Western these categories are. I wonder what differences there would be if this study was extended worldwide. How about mobile users in Africa or China or India, for example? Mobile Web is just going to get bigger, user base will be larger and more and more developers will need to think about their mobile strategy more than they do now. How many apps do you have installed? The article talked about the number of apps that users tend to have installed. I guess the implication was that the more confident the mobile user about what they do online the more applications they would have installed. I suspect (I hope) that HTML5 will change all of that as more mobile browsers become more capable of running complex Web apps that these app downloads will move to becoming simply website/web app URL bookmarks. Anyway, it reckoned that the average user has 20 apps installed, of which they use less than half; rookies have only 9 installed, and those labelled restless have 42. I’ve recently spent a lot of time on my mobile phone (stuck in bed for days after damaging my back, other blog post soon), and have just uninstalled the apps that I don’t use in order to free up memory and speed up my HTC HD2 running Windows Mobile 6.5. Here’s what I now have installed (in not particular order), which are the apps that I actually use. This doesn’t include default apps that came bundled with the HTC HD2. How many apps do you have installed on your smartphone? Do you use them all? 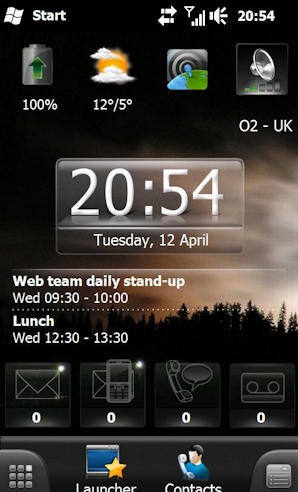 Posted on Wednesday 28 September 2011 Thursday 14 December 2017 Categories WebTags .Net, .net magazine, app, application, apps, mobile, mobile phone1 Comment on Mobile attitudes–how many apps do you have installed? I haven’t used an advert blocking add-on for my browsers until now, and I haven’t looked back. 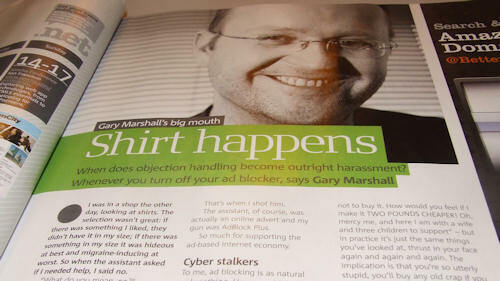 In the article Marshall described how when browsing from one site to another the adverts… well, followed him! I’ve had the same experience. You know when you unconsciously just know that something’s not quite right? I had that feeling while browsing the Web a couple of weeks ago. I tend to ignore adverts on Web pages but this particular one caught my eye. I wish I’d taken a screenshot at the time. It was showing me stuff that I’d been looking at on another site a few minutes before. Not just similar stuff, the exact same items that I’d been looking at. I felt I was being spied on. The ads are new, and they’re known as retargeting. Cookies track what you’ve looked at and follow you around the internet, shouting at you to look at them. In theory, they’re supposed to offer extra inducements – “I see you looked at this shirt and decided not to buy it. How would you feel if I make it TWO POUNDS CHEAPER! Oh, mercy me, and here I am with a wife and three children to support” – but in practice it’s just the same things you’ve looked at, thrust in your face again and again and again. The implication is that you’re so utterly stupid, you’ll buy any old crap if you see it often enough. The fact of the matter is that advertising works, and we really are gullible enough to see something on the telly, or glance at it in a magazine or newspaper, and race out to buy it believing that it will help us become happier, more content, more attractive, cool. That’s just the way that we’re wired. However, these days Jane and I don’t tend to watch much live TV any more. With BT Vision we record most of the programmes we want to watch, and then fast-forward through the adverts. When listening to the digital music service Spotify I realised the other day that I completely switch off during the adverts. I stop listening, or distract myself with something else. It’s not a conscious thing. I found myself, the other day, thinking it odd that there had been no adverts while I was listening. And yet I suddenly realised there was an advert playing right now! I’d just tuned it out. The same kind of life skill that I see Reuben and Joshua are learning even at the ripe age of two when we tell them that it’s time for bed. I object to adverts on my clothing. I don’t really like wearing rugby shirts that advertise whisky or stout, because I don’t drink. Why should I be a free advert for alcohol? I do notice adverts in magazines, though. I get a lot of emails inviting me to add ads to my blog or website. I always say no. Well, not always, I sometimes write back … but that’s another story for another day. I always say no because, although they could potentially raise a couple of hundred quid a year adverts on blogs just annoy me so I presume that they will annoy other people too. Besides, I’d have no control over what was being advertised on my website. So … no adverts now or ever on this blog, folks. I’ve not had a single annoying advert since, and to be honest I really don’t miss them. Of course, the irony of seeing a piece of software advertised in a magazine which led me to immediately downloading and installing it there and then hasn’t passed me by.